PINK SUGAR KISS: A soft, sweet blend of delicious vanilla, caramel, lemon drops, and cotton candy with fruity notes of raspberry and Italian sweet orange, plus a drizzle of sultry musk. A best selling scent! Handmade using the hot-process method of soapmaking our soaps retain all of the naturally occurring Glycerin; a wonderful humectant that leaves your skin soft and conditioned. 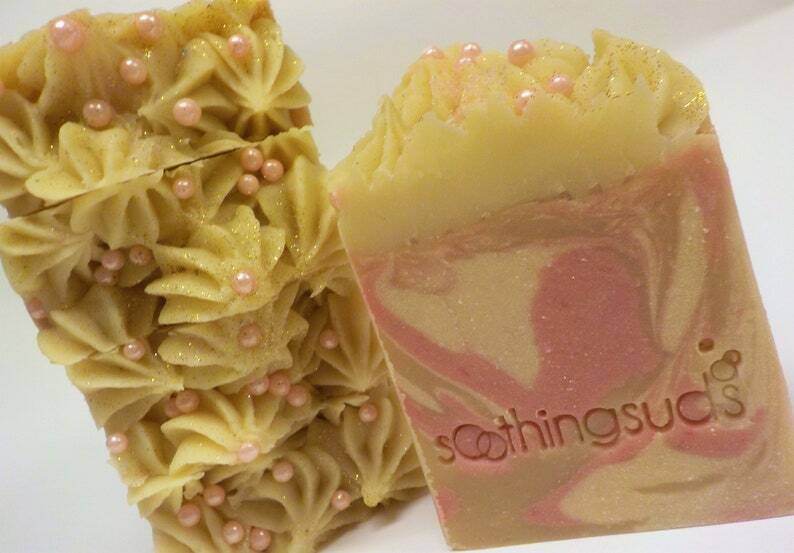 We have added skin conditioning Goat's Milk and fresh yogurt to this soap bar for extra skin soothing benefits. Our finely crafted Olive Oil & Shea Butter formula makes a deliciously rich bar of soap that gently cleanses with lots of thick, creamy, silky lather....for pure soaping bliss! Ingredients: Olive Oil, water, Coconut oil, sodium hydroxide, shea butter, goatmilk , fresh yogurt, fragrance, mica, mineral pigment, and/or candy sprinkles and/or body safe glitter.